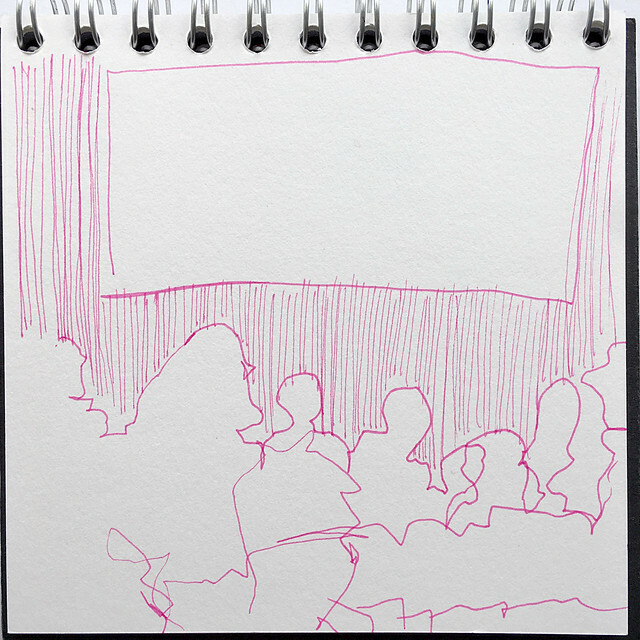 One of the neat things about “blind drawing” (creating a sketch without looking at the paper while you are doing it) is that you can do it in the near darkness of a cinema just as well as in bright sunlight. Above is a drawing I did last night while watching The Bookshop at the Ultimate Picture Palace (more on that experience in yesterday’s post). Adding shading was a bit more tricky in those conditions but it wasn’t pitch black and, in this style, a few crossed lines really don’t matter. I think it was a worthwhile step as now I’ve got a balance of tonal value in the image too – blank, light lines and shading but representing light, mid and dark.